JDC - Archives : JDC staff and other representatives visiting a children's home in Budapest. Title JDC staff and other representatives visiting a children's home in Budapest. Description JDC staff and other representatives visiting a Children's home at 26 Delibab ucca. 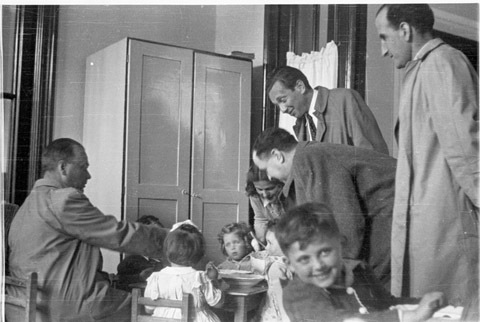 Karoly Olt, Hungarian Minister of Public Welfare joins a group of Jewish refugee children at lunch in a JDC supported children's home. He expressed his government's satisfaction for the work that has been accomplished by the JDC in rehabilitating refugee Jews in Hungary. Looking on are, left to right, Mr Israel G Jacobson, JDC Director for Hungary, Dr Geza Szucs, Chairman of the Jewish Relief Committee in Budapest and Mr. Istvan Simonovits of the Hungarian Ministry of Public Welfare.